Preview of Pocket God’s newest episode splash! As we’ve mentioned, Dave and Allan have been crazy-mad-busy working on several things at once. For starters, they’ve been doing some contract work with various other clients. For middlers, they’ve also been working on a brand spanking new game. But for enders, they’ve also been working on the newest and bluest Pocket God update. So enjoy the preview of Episode 48: Call of Booty, coming soon to an iOS near you! Sorry this took so long! Life tends to heat up and send you tumbling sometimes. But here we are, with the next two stops on our trip around Memory Island. Description: Sacrifice Pygmies to the sacred volcano! Now we had committed to an update a week for a certain amount of time, so the updates had to be fairly simple. 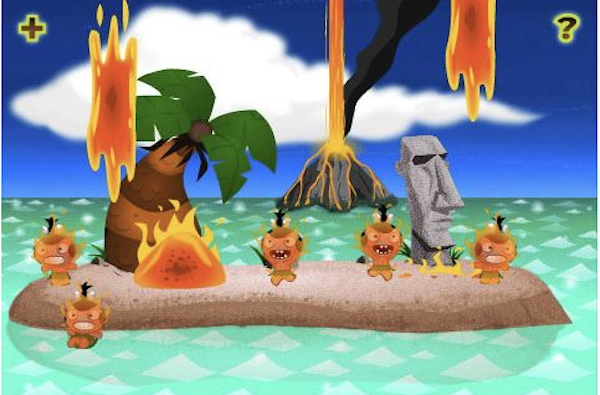 All we added was a volcano and the ability to flick the pygmies into the distance. They either hit the ocean or the volcano. Dave said he knew we were onto something the first time he plugged in the “smack!” sound I provided when you flicked the pygmy. You had to aim and put 3 pygmies into the volcano to make it erupt. Lava would then rain down and the pygmies would catch fire, scatter and jump into the ocean. About this time, we decided to update the icon. All I did was alter the original, hastily adding the volcano and the fire. We were banging things out so quickly and keeping up our freelance work, so there were many things I look back on and cringe. But soon I would be creating a new one from scratch and the art would evolve as we shed our freelance to work on PG full time. Oh, and in the screenshot you’ll notice I’d included a Moai statue, without knowing of its deeper historical and cultural significance. After being made aware of this, we took the opportunity to change the statue in an effort to begin building our own world and mythology. Episode 4: Shake That App! 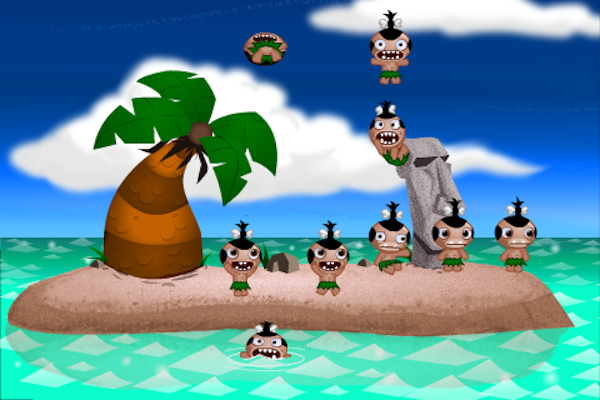 Description: Shake the world of your Pygmies up by shaking your iOS device! Originally it was just shaking the app to make an earthquake, but Dave was the one who asked what would happen if you just held the phone upside-down, or even tilted it. It made sense that they would fall down and then get up, so I had to make a bunch of different pygmy states. To further complicate it, we decided that they could fall face forward or backwards, so it got a little hairy in development. Because of this, it was the most complex interactivity we’d created in the early “update every week” phase. So now that Pocket God has erupted and shaken up the world of apps, what would torrential new event would strike the Pygmiverse next? Would it be something people could sink their teeth into or would it make them go unconscious? Stay tuned, as we update “Pocket God … Revisited!” regularly on our way to a new and exciting development in the Pygmiverse! So we’ve got some Pocket God action brewing behind the scenes. Both Allan and Dave are putting their heads together, then immediately separating their heads as having two heads touching makes it really hard to concentrate on anything. Allan’s got art things going and Dave’s got programming things going and the Pygmies have SOMETHING going, but what it is we don’t know yet. So in preparation, we’re going to take a walk around Memory Island and examine past episodes. Allan will contribute his present-day thoughts on past updates as we go along. Join us on our trek through Pocket God history! Description: Create new islanders and move them upward. We started sketching ideas on a piece of printer paper, fleshing out the basic concept. We decided to keep it super simple and release it inside of a month. This was when apps came out that didn’t do a lot, such as faked drinking beer. I think all you could do is pick them up and throw them in the water. They would just walk around and stand. I think that the episode title idea came up at the last minute (or maybe it was even after the first release) because we wanted to promise updates. Dave thought that would intrigue people. The title of this episode was a quote from an animated piece that came out after the internet bust called “Laid Off Land” by Odd Todd. Somewehere in the short, the narrator (Odd Todd) mused that before he was laid off that he would look around at these people just hanging around a coffee shop with “nowhere to go and nothing to do”…and now he’s one of those people. I always thought that was a funny line; so it’s the first thing that popped in my mind because at first there WAS nowhere to go and nothing to do in Pocket God. Description: This update contained optimizations to make the app a smaller download. So the question was… if they’ve got nowhere to go and nothing to do, where will we take them and what will they do? The answer was… nowhere and nothing. But nowhere was a lot faster, and nothing was a lot sleeker! The first thing Dave noticed was that the game was way too big for the tiny amount of content…so he had to go in and optimize. Originally all the graphics were separate pieces, but generally games use “texture maps” where all the graphics are consolidated onto a single piece and the art is separated programatically. There wasn’t really a significant art addition as far as I can remember. So now with the app optimized and ready to roar, what would erupt next from the depths of Dave and Allan’s minds? And how would it shake up the world of Pocket God? 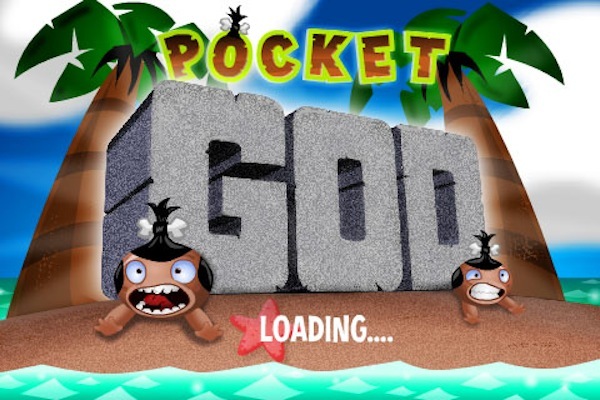 Stay tuned, as we update “Pocket God … Revisited!” regularly on our way to a new and exciting development in the Pygmiverse! The Zombie Pygmies return to Facebook! The Zombie Event is LIVE at Pocket God Facebook for the next five days! The tombstone is beckoning from the unfathomable depths of Pygmy perdition to create leagues of brain-eating bad boys. In order to summon these starving souls, all you have to do is complete the five quests. Make the necessary sacrifices, and you can level up, gaining additional Pygmy treasures on the way! 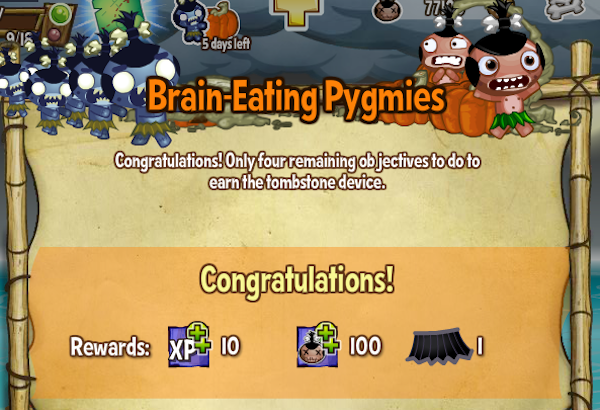 With each stage, you gain a new piece of “Vampire Pygmy” wear until you become eligible to gain the last reward, the Tombstone device. Once you’ve gotten the device from the store, start digging the grave and drop a Pygmy in… and watch Zombie-mania take over! The zombie will try to bite other Pygmies in order to zombify them… unless the other Pygmy has a hatchet, and then watch the tables turn. There are also other ways you can dispatch the dreaded undead; try flicking them or grabbing them and see what happens! Get ready for Halloween this year by exerting your power over their lives, their deaths… and their undeaths! Fun in the Swamp… on Facebook! Pocket God Facebook is starting a new Toad Challenge! 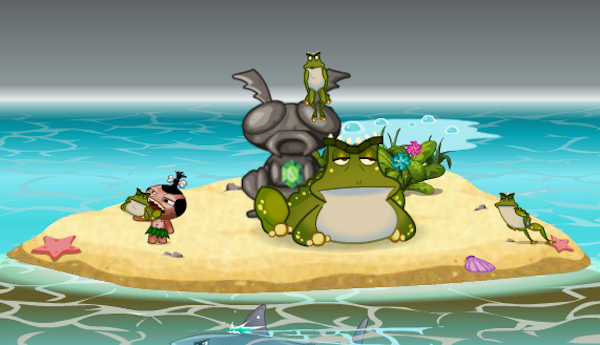 Complete the five challenges and you will win the Toad Idol! As a reminder, toads can be scrumptious if you’re trapped on a solitary island, and the Pygmies know it. However, eating a toad has its own dire consequences! Plus, if you click on the toad, Pygmies might just find themselves on the other side of that food chain! Will the Pygmies devour… or BE DEVOURED? Click on the toad to have him eat a Pygmy. Eventually, the Toad will either spit him out as a skeleton… or, if you click the toad again within five seconds while his cheeks are puffed, the Toad can spit him out as a helpless bubble! And what happens when you click that bubble? The mind reels at the thought! Can you leap to the occasion? 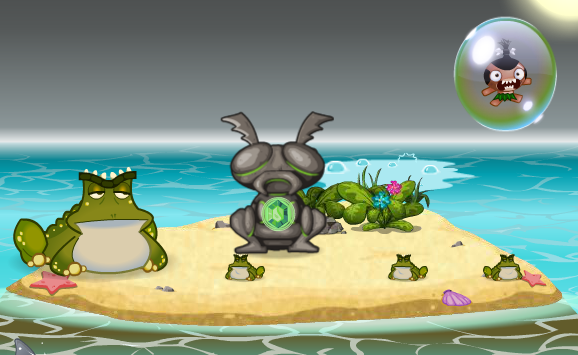 Can you hop to a new mastery of deification, warts and all, without croaking? Give it a try! The Challenge ends September 1!